The Cube Deluxe Floating Habitat is a hit with the kids! Its 60-inch square walls and holes make it the ultimate floating fort, and its inflatable bottom features a drain, so it can be used outside the pool as a kiddie pool. Plus, the inflatable's rugged, heavy gauge material holds up during endless hours of horseplay. Measures 5 ft. x 5 ft. x 5 ft. Kids will love to hitch a ride on everyone's tropical favorite, the clown fish! This big, colourful Clown Fish Inflatable Ride-on Pool Toy measures a full 67-inches and features two grab handles. The heavy duty vinyl is built to last. The Clown Fish Ride-On will make a big splash at your family gatherings. Designed for hanging over and relaxing in the water, the Curved Noodle in its simple blue and white design visually pops off the water. Measuring approximately 3.5' wide from side to side, the 6" diameter noodle provides the perfect buoyancy to submergibility ratio. Use your imagination for play and lounging. Easy to inflate and always a favorite for on-the-go needs. This Foam Ring Buoy adds safety to any pool area. Its soft surface will withstand years of sun and weather. Comes complete with nylon 7.5 ft tow rope sewn to the straps on the buoy, with a multi-color trim. 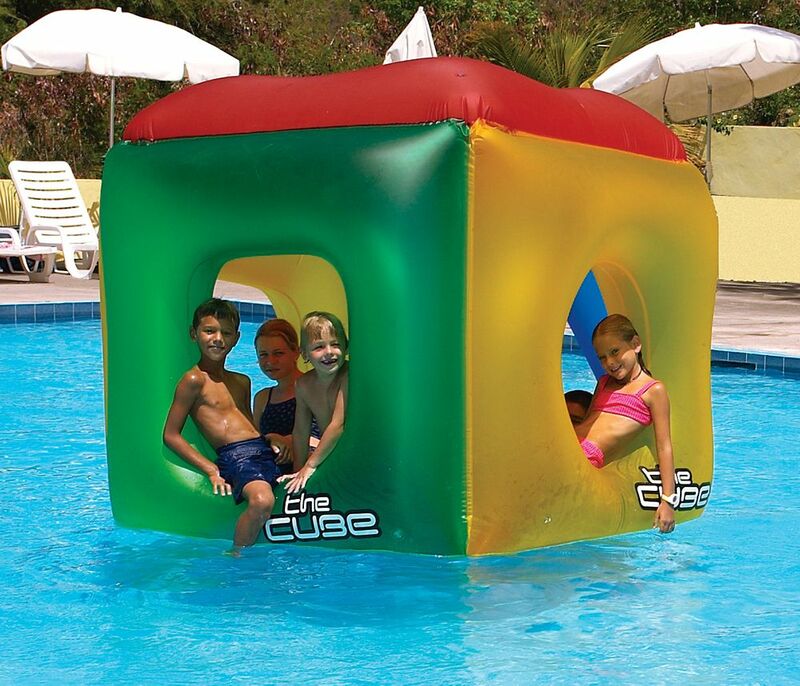 The Cube Deluxe Floating Habitat Pool Toy The Cube Deluxe Floating Habitat is a hit with the kids! Its 60-inch square walls and holes make it the ultimate floating fort, and its inflatable bottom features a drain, so it can be used outside the pool as a kiddie pool. Plus, the inflatable's rugged, heavy gauge material holds up during endless hours of horseplay.